^ Captain America – The First Avenger. British Board of Film Classification. 2011-07-13. ^ Tadena, Nathalie. Disney Acquires Distribution Rights to Four Marvel Films From Paramount. The Wall Street Journal. [2013-07-02]. ^ Finke, Nikki. Disney Completes Purchase of Marvel Home Entertainment Distribution Rights. Deadline Hollywood. 2013-07-02 [2013-07-02]. ^ Palmeri, Christopher. Disney Buys Rights to Four Marvel Movies From Viacom's Paramount. Bloomberg. 2013-07-02 [2013-07-02]. ^ Ryan, Mike. Should We Now Call Him 'Captain England'?. Yahoo!. 2010-05-19 [2010-06-28]. （原始内容存档于2011-07-02）. ^ McNary, Dave. Stanley Tucci joins Captain America. Variety. 2010-06-07 [2011-03-23]. （原始内容存档于2011-07-21）. 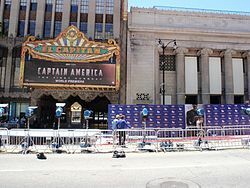 ^ Watch the Captain America Red Carpet Premiere LIVE on Marvel.com. Marvel.com. 2011-07-15 [2011-07-18]. （原始内容存档于2013-04-09）. 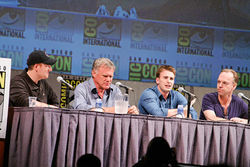 ^ See Captain America: The First Avenger Early at Comic-Con. Marvel.com. 2011-07-18 [2011-07-19]. （原始内容存档于2013-04-09）. ^ Marvel Movie Update: New Release Schedule!. Marvel.com. 2009-03-12 [2010-03-28]. （原始内容存档于2011-07-02）. ^ Global sites & Release Dates. Paramount Pictures. [2011-05-06]. （原始内容存档于2011-07-04）. ^ Captain America: The First Avenger (2011). Rotten Tomatoes. [2015-07-19]. ^ Captain America: The First Avenger. Metacritic. CBS Interactive. [2011-07-28]. ^ McClintock, Pamela. Box Office Report: ‘Captain America’ Wins With $65.8 Million, Launching New Superhero Franchise. The Hollywood Reporter. 2011-07-24 [2014-05-07]. （原始内容存档于2014-05-07）. ^ Finke, Nikki. 'Captain America' Opens To $4M Midnights. Deadline.com. 2011-07-22 [2011-07-22]. （原始内容存档于2011-07-22）. ^ Smith, Grady. Box office update: 'Captain America' soars into first place with $25.7 million on Friday. Entertainment Weekly. 2011-07-23 [2012-06-04]. （原始内容存档于2013-04-09）. ^ Gray, Brandon. Weekend Report: 'Captain America' Rockets to the Top, 'Potter's Bubble Bursts. Boxofficemojo.com. 2011-07-25 [2012-06-04]. （原始内容存档于2013-04-09）. ^ War - World War 2: 1980-Present. Genre. Box Office Mojo. 2012-03-16 [2012-03-16]. ^ 李世珍. 《變形金剛3》制霸2011洋片榜 吸7.6億攻台票房王. 蘋果日報. 2011-12-24. ^ Ng, Philiana. Teen Choice Awards 2011: 'Pretty Little Liars,' Rebecca Black Added to List of Nominees. The Hollywood Reporter. 2011-07-19 [2011-07-27]. （原始内容存档于2011-07-27）. ^ SCREAM 2011. Spike (TV network). [2011-09-07]. （原始内容存档于2011-09-23）. ^ Gallo, Phil. Backbeat: Rolfe Kent Receives Career Achievement Honor at BMI Film and TV Awards. Billboard. Prometheus Global Media. 2012-05-17 [2012-12-09]. （原始内容存档于2014-07-01）. ^ People's Choice Awards 2012 Nominees. People's Choice Awards. [2011-11-09]. ^ O'Hara, Helen. The Awards Nominations Are Here!. Empire. 2012-03-05 [2012-03-06]. （原始内容存档于2012-11-14）. ^ Best Hero Nominees. MTV News（英语：MTV News）. [2012-06-05]. （原始内容存档于2012-06-05）. ^ Nominations for the 38th Annual Saturn Awards. Saturn Award. Academy of Science Fiction, Fantasy & Horror Films（英语：Academy of Science Fiction, Fantasy & Horror Films）. 2012-02-29 [2012-02-29]. （原始内容存档于2012-02-29）. ^ Boucher, Geoff. 'Captain America' sequel set for April 2014. Los Angeles Times. 2012-04-05 [2012-04-06]. （原始内容存档于2012-04-06）. ^ Patten, Dominic. Russo Brothers in Talks For Marvel's 'Captain America' Sequel. Deadline.com. 2012-06-06 [2012-06-06]. （原始内容存档于2012-06-06）. ^ CAPTAIN AMERICA: THE WINTER SOLDIER BEGINS FILMING. Marvel.com. 2013-04-08 [2016-01-14]. （原始内容存档于2016-01-14）. ^ Weintraub, Steve. Directors Joe & Anthony Russo Confirm They'll Direct Captain America 3; Say They're Breaking the Story Now with Screenwriters Christopher Markus & Stephen McFeely. Collider.com. 2014-03-11 [2014-03-14]. （原始内容存档于2014-03-11）. ^ Strom, Marc. Captain America to Return to Theaters May 6, 2016. Marvel. 2014-04-07 [2014-04-07]. （原始内容存档于2014-04-07）. ^ Kroll, Justin. ‘Captain America 3′ Takes Shape at Marvel (EXCLUSIVE). Variety. 2014-01-21 [2014-01-21]. （原始内容存档于2014-01-28）. ^ Fleming Jr, Mike. Daniel Bruhl To Play Villain In 'Captain America: Civil War'. Deadline.com. 2014-11-14 [2014-10-30]. （原始内容存档于2014-11-14）. ^ Marvel Studios Begins Production on Marvel's 'Captain America: Civil War'. Marvel.com. 2015-05-07 [2015-05-07]. （原始内容存档于2015-05-07）.